There is a connection between the astrolabe that Regiomontanus gave to Cardinal Bessarion in 1462, and “The Flagellation of Christ” by Piero della Francesca. For a brief summary see below. For an introduction of 50 pages click here. For a “silent lecture” (over 200 pdf images including explanatory text) click here. For a full account see David King, Astrolabes and Angels, Epigrams and Enigmas – From Regiomontanus’ Acrostic for Cardinal Bessarion to Piero della Francesca’s “Flagellation of Christ”, Stuttgart: Franz Steiner, 2007. Only recently have we achieved new insights into two monuments to the intellectual genius of the Renaissance, an astrolabe and a painting. Both are objects of exceptional beauty and each is based on sophisticated mathematical notions. Each of these has caused scholars – historians of science and historians of art, respectively – a great deal of trouble. As it happens, the two are intimately related. One is an astrolabe – a model of the three-dimensional heavens in two dimensions – that was presented to the ageing Greek Cardinal Bessarion in Rome in 1462 by his new protégé, the young German astronomer Regiomontanus. This is engraved with the image of an angel and an ingenious Latin epigram that is geometrically arranged. Epigrams were very popular in Antiquity and in the Renaissance, but this one is unique of its genre. Here eight hidden vertical axes of an acrostic contain all sorts of hidden messages that would have especially pleased the Cardinal once he had figured them out: references to himself and his rank, to Regiomontanus, and to an old Byzantine astrolabe that he had shown to the young German. The angel is Bessarion, but not the Cardinal. There are several plays on the Latin word cardo, meaning “hinge, axis or pole”. In brief, two astrolabes come together in one, two poems, two languages, two Bessarions, two men who used the name Ioannes, two places, Rome and Constantinople, all come together in one. When Bessarion saw the epigram, he must very quickly have noticed something about the letters that Regiomontanus cannot possibly have intended, namely, that – mainly by chance – groups of them reminded him of various people who were involved in the Passion of Christ, the Fall of Byzantium, or his own political, intellectual and personal agendas. 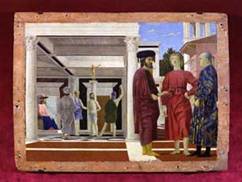 The other monument is a painting, “The Flagellation of Christ”, the most enigmatic and controversial work of the leading mathematician-artist of 15th-century Italy, Piero della Francesca. The symbolic flagellation with five persons takes place in the background on the left, and in the foreground on the right there are three “modern” figures: a Greek ambassador, a young man with a rather angelic face, and an Italian dignitary. These images are not contemporaneous portraits, for otherwise they surely could have been definitively identified. In the past 150 years over 40 attempts have been made to identify these three men, with wildly different results. In fact, until recently, nobody had ever convincingly explained who or what these three persons represent. This is because the “programme” behind the painting owes its inspiration to the angel and the letters of the epigram on Regiomontanus’ astrolabe. The geometry and symmetry of the painting reflect those of the epigram, and the letters of the epigram – read from left to right but also from right to left – suggest double or multiple identities for each and every one of the nine images – eight persons and the classical god on top of the column behind the Christ-figure – that are found in the painting. It is not surprising that we can find the letters for these names amongst the letters in the epigram; what is surprising is that the names we can find for the first five spaces correspond to the five persons and one classical god in Piero’s Flagellation scene, further providing a selection of very likely candidates for the three men on the right. The bearded man is Bessarion, but his facial features show him more as he might have looked in Florence in 1439 before he became a Cardinal. Nevertheless the image does represent the Cardinal because the angelic figure in cardinal red beside him represents the young Regiomontanus, whom the Cardinal had brought to Italy in late 1461. However, the image representing the young German embodies five other persons, three who had died recently and two who were long dead, all close to Bessarion’s heart. Part of the complex iconography is the decoration with thistles on the gown of the three individuals represented in the one man on the right: this is now a play on the Italian word cardo, meaning “thistle”, and one of their family names. Both the astrolabe and the painting may be “smoking guns” but both are silent about the way in which the epigram actually inspired the painting. The clues to the connection between the two are mainly mathematical. The readings of groups of letters in the epigram to derive names for the persons in the painting are inevitably subjective and the findings presented here are all hypothetical. However, they are sufficiently convincing that this author believes that he is not the first to have looked at the epigram in this way. We have no record of an encounter between Bessarion and Regiomontanus on the one side, and Piero and a potential sponsor on the other. However, some occasions do present themselves on which the Cardinal and his protégé might have passed through Piero’s hometown of Sansepolcro, or nearby Arezzo, where Piero was working on the spectacular frescoes known as “The Legend of the True Cross”. The painting once bore a title, long since removed, namely, the Biblical phrase Convenerunt in unum, “they came together in one”. The basic meaning applies equally well to the astrolabe. Somehow, Bessarion and Regiomontanus, maybe with the help of some close friends, developed the idea for this remarkable painting in which over twenty people and four classical gods come together in three different scenes at three different times, all coming together in one in spectacular perspective.